Vellinakshatram malayalam film magazine is one of the most popular periodical which highlight the doing and happenings in the film industry. Published by Kerala Kala Kaumudi, this entertainment magazine is widely read by the overseas Indian community around the globe. Segments like Hit Chart, VCD Releases, Locations Reports, Ithulukal, Fans Mail, Bollywood Buzz and news from Tamil industry keeps readers engaging till the last page. Even though with the advent of internet and social networking sites has made a sensation change in the reading habit of the people, the relevance of print media has not transformed much. News and reports available in the online media might fetch some good viewers but it is not sufficient to keep them engaging. During this juncture, the role played by magazines should be well appreciated. Kerala being the most literate state in India has a significant place in developing the reading habit of people. As films do share a major role in the daily life of the populace, they give prime importance to update themselves about the news feeds from the film world. Among the various film industries in the country, malayalam has contributed much for the growth providing many multitalented personalities. Malayalam film industry has grown to an inventive stage with a bunch of talents in the front and behind the camera. 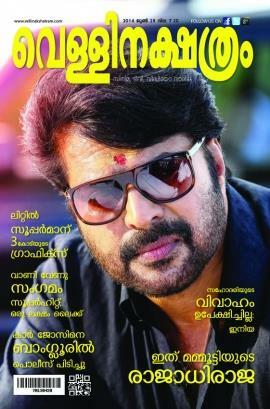 Different periodicals and magazines in malayalam language has played their part in spreading the latest updates on the film. Among the number of publications, 'Vellinakshatram' has created its own place by highlighting the doing and happenings in the malayalam film world. Published by Kerala Kala Kaumudi, this entertainment magazine is widely read by the overseas Indian community around the globe. Segments like Hit Chart, VCD Releases, Locations Reports, Ithulukal, Fans Mail, Bollywood Buzz and news from Tamil industry keeps readers engaging till the last page. The segment Hit charts gives consistent box office rating of the newly released movies. Location reports on ongoing projects have already captured the hearts of the readers as their team of passionate writers divulges much about the movies. Being the handheld entertainer for the movie lovers, this film weekly provides a 360÷ view on the malayalam film industry. This film weekly has also spotted many new talents and brought them to the attention of filmmakers. Tightly packed in style and richness, 'Vellinakshatram' targets the young reading community interested to update news about their favourite actors. Vellinakshatram is a trend setter which brings to light the latest from the malayalam film world mostly handy to the readers.